Happy Big Game Winter Woohoo! It's that time of year again! 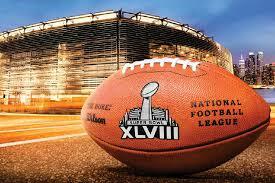 The Superbowliest time of year that is!! Ok...to be honest, I don't really care about football. GASP! I know, but it's the Superbowl! I know. Look, without getting into the history of how that just wasn't a thing we paid much attention to in my home, we'll just go ahead and say that it wasn't really until College that I started joining in on parties for the event even. And obviously, as a lover of beer and food and loud activities with drunk friends, I quickly caught on to the celebration atmosphere of the thing. But, this year, it's different. Because this year, we're superbowling in the city! Well...sort of. Granted, the game is taking place physically in New Jersey, but we like to lay claim to anything that's spitting distance--sorry Jersey! But if you've been anywhere near Times Square, then you've seen that we've been struck by the pigskin bug. Romantic-sounding right? Hello have you seen the toboggan run? Of course that still doesn't mean I have a clue as to who is actually playing in the Super Bowl, or what their colors are, or whatever else one should know at this point. All I know is I've got a lot of work. Not so much of the guiding sort, but more of the catering stuff. As I build my company up I'm still earning some income as a cater-waiter for Great Performances. And they're all over these pre-game events, which is great for me AND exhausting. After this weekend things do slow down a bit, so I've decided to keep the spirit of The Big Game alive and well in my promotional efforts. So if you're around town due to this event or for the Chinese New Year, which is also this weekend and will be celebrated in the biggest Chinatown in the west, or for any other reason at all you might want to check out my offer on NYC GO! You'll get 20% off on all tours THROUGH February! That's all for now...I've gotta get ready for my next gig! 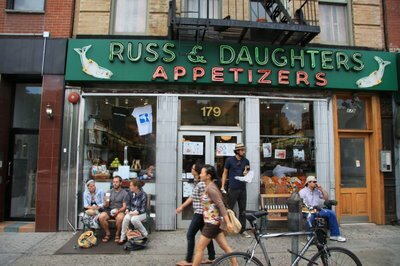 Although, there are few foods more associated with New York City than the classic: bagel & lox, there are limited vendors in this city that provide the true authentic treat, especially the way that Russ & Daughters does. They're known, not only for the quality of their fish, but also for how expertly thin they're able to slice their smoked fish! And as a woman, I'd be remiss if I didn't point out that in an age of '& Sons' he was the first to add his daughters to his legacy! So, if you're interested in learning some more about the great Russ & Daughters institution, check out this event from the Gotham Center. Thanks to Justin Ferate for the email info! When Joel Russ started peddling herring from a barrel shortly after his arrival in America from Poland, he could not have imagined that he was witnessing the birth of a gastronomic legend. Here is the story of this "Louvre of lox" from its humble beginnings through the Great Depression, the food rationing of World War II, the passing of the torch to the next generation just as the flight from the Lower East Side to the suburbs was beginning, the heartbreaking years of neighborhood blight, and the almost miraculous renaissance of an area from which hundreds of other family-owned stores had fled. Filled with delightful anecdotes about how a ferociously hardworking family turned a passion for selling perfectly smoked and pickled fish into an institution with a devoted international clientele, Mark Russ Federman's reminiscences combine a heartwarming and triumphant immigrant saga with a panoramic history of twentieth-century New York, a meditation on the creation and selling of gourmet food by a family that has mastered this art, and an enchanting behind-the-scenes look at four generations of people who are just a little but crazy on the subject of fish. To register for this event, click here ( http://gothamcenter.pmailus.com/pmailweb/ct?d=YrtCUwAWAAEAACJ0AAbGpQ ) ." Well it's March people, finally the Spring is UPON us!!! And to bring in March, we, in NYC like to celebrate the Irish in our city with a grand tradition for the holiday of St. Patrick's. We have the largest celebration of this holiday in the world with our annual St. Patrick's Day Parade, that has been going on since 1762. Now, because St. Patrick's Day falls on a Sunday this year, the parade will be held on Saturday, March 16th. 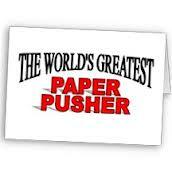 The parade begins at 44th street and fifth, 11am and finishes at 86th and 5th around 5pm. This is the largest and longest parade that the city has, as everyone comes out to celebrate the Irish in them! Because the city will be celebrating a day early, I wanted to offer an event to include feasting and drinking and a little walking and learning, on the actual HOLIDAY! 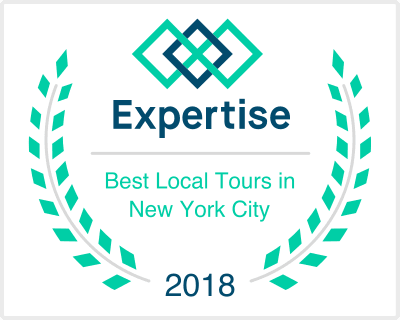 So I would love for you to join me on Sunday, March 17th at 11:30am, for a 2-2 1/2 hour walking food and drink tour in the historic Lower East Side immigrant community. We'll be just north of the famous five points area, where we can touch on some of the history regarding the newly American Irish families that lived down there and the leaders that brought them up through corrupted ranks. We'll pop in and out of some appropriately themed pubs, taverns and saloons, for a little taste of Ireland. This is a one-day only event and it won't happen again until next year! So why don't you nurse your hangover with a little more beer and join me for this fun and festive tour, that I promise will be a one-of-a-kind experience! Only 20 spots available, so book your tickets today! 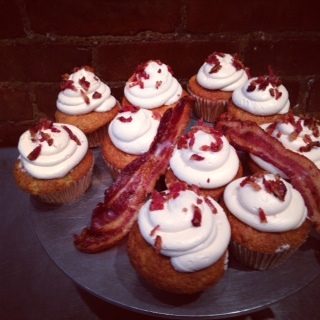 Several restaurants are celebrating in a variety of ways, but I would highly recommend One Cup Two Cupcakes, making the above Maple-Bacon yummies for the day! And, of course, Baconery. Even if they celebrate the swine EVERY day. Speaking of which, 'Swine is probably a great place to go to as well! I know, I LOVE bacon. But the truth is, it's not very good for you! So, after you've come out of your sodium-coma, go ahead and make your way over to the New York City Vegetarian Food Festival. 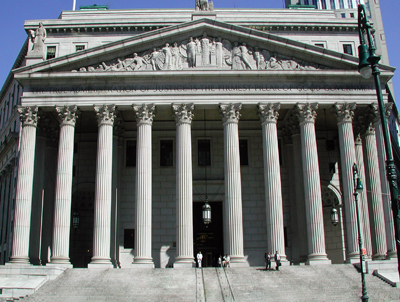 The festival takes place this weekend at the Metropolitan Pavilion. The space is open from 10am-5pm both Saturday and Sunday, March 2nd and 3rd. VIP Tickets are $30 a day and $50 for both days, and get you priority entrance with 5 raffle tickets. General admission is $5 and can be purchased at the door. Just a couple of their vendors include: PETA, Earth Balance, Harmony Cafe Kitchen, Chicago Vegan Foods, & Back to the Roots. Not to mention the lectures, performers and entertainers there to educate your mind and body! Did I mention there's stuff for your kids? There is! So PIG out today and cleanse your soul tomorrow...that's what I would do anyway! In order to promote any business one needs funds. Well that's one thing that I've been lacking for quite a while now...you know since I left the high-paying life of stability/misery in pursuit of my happiness. Thanks to the smart-smart people who came up with the idea of crowdsourcing, I've now been given an opportunity to put some money into my business without actually having to seek big-pocket investors who want to steal your soul and creative control in exchange for their dollars...of course if that's anyone out there and you're thinking you might like to invest in a food tour company...CALL ME! The campaign is now about 8 days away from it's deadline and I'm hoping to raise at least another $500, but hopefully I can get more. If I reach my goal I will use the funds for advertising and insurance costs. If I exceed those goals, I'll be able to provide some money to a local food charity or two that I care about. They say that the most successful campaigns have videos attached and I was FINALLY able to put one together. So here's my final push! I have a video on the site and everything. There are some GREAT perks attached to the campaign for contributors at every level. Check out the campaign, the video and share with all of your friends, family, and even your enemies with deep pockets! OK maybe not your enemies, I might have to then give them a tour! Thanks for checking out the site and I hope you have enjoyed what I've posted so far. Please feel free to let me know if there's something you have an idea for or are interested in guest blogging. My upcoming goals are: finishing my vendors/friendly links page and, of course the LAUNCH PARTY which I have just over a month to prepare for! MORE details to come soon. February Fun with Food in NYC! 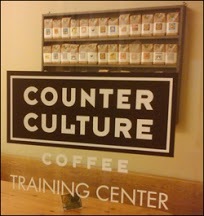 Counter Culture Presents a challenge for your tastebuds. If you think you've got a discerning palate then you should come on out and see for yourself at tomorrow's event. Details about the blind tasting event can be found on Facebook. If you're not in NYC on Feb 20th, but you are near any other Counter Culture location, you can find out information on those other events here. For two days only: Wednesday, February 20th and Thursday, February 21st you can taste the flavors and spices of Malaysian Street food in the HEART of NYC over at Bryant Park! BONUS--if you book tomorrow's tour, I'll include some stops in your ticket price. Otherwise it's a great event to check out on your own! 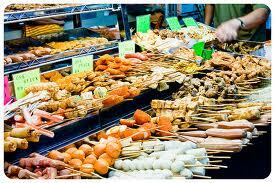 Heated tents with several of New York's best Malaysian restaurants will be providing cheap eats for lunch and dinner. Details can be found here. City Bakery's Hot Chocolate Festival Continues! With flavors like Espresso, Darkest Dark, and Bourbon coming up this week you will likely find me at City Bakery conducting my own selfish Hot Chocolate Tour...one tip: DO NOT DISTURB a woman indulging in her chocolate! If you need the address or further information, please feel free to check out City Bakery's website here. Friday February 22nd, kicks off the New York City Brewers Guild week-long celebration of all things BEER! Especially tasty, crafty locally made beer. The opening night bash is happening at the great Galapagos Art Space in Dumbo. There will also be several events throughout the city including some featured fun-times at City Winery and Eataly's La Birreria. For information on all events going on, check out the brewers guild's official site. I call this St Patty's Pregame! Happy Drinking to you! (Don't forget to eat some protein to soak up that alcohol!